Spanning four volumes and many centuries of history, from Caesar's invasion of Britain to the start of World War I, A History of the English-Speaking Peoples stands as one of Winston Churchill's most magnificent literary works. Begun during Churchill's 'wilderness years' when he was out of government, first published in 1956 after his leadership through the darkest days of World War II had cemented his place in history and completed when Churchill was in his 80s, it remains to this day a compelling and vivid history. 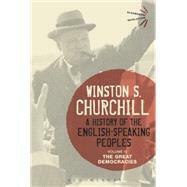 The Great Democracies is the fourth and final volume of Churchill's history. Here, Churchill reaches the modern era. For Britain, this was the high Victorian era of Palmerston, Gladstone and Disraeli, an age of free trade and imperialism as the British spread to Africa, Australia and New Zealand. Meanwhile the fledgling republic in America endured the great crisis of the Civil War to take its first steps on the road to becoming the world superpower that endures to this day.